today a went to only two shows, skipped the third by choice. wanted to see stuff i don't usually see. 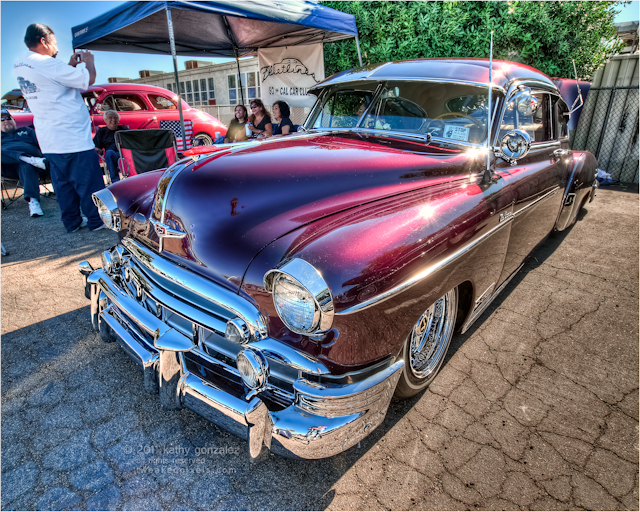 this one is from the viejitos cruisin on a sunday afternoon show over in fullerton. i've seen a few of their cars here and there, but was interested to see what a show hosted by them would pull in. i was not disappointed. a virtual chevy buffet, some of los angeles and orange county's finest showed. and the people were very nice too. i was greeted by the president of the club when i got there. as i walked about and shot the bunch that were there initially, other clubs showed up and filled the lot, until they were parking two cars wide up the aisle. it was really not a huge lot, and i had to park down the street. several people came over to talk to me, and ask to be sure to get their cars. guess i'll be busy over the next few days posting some. and there were so many more extraordinary cars that came out, i'll be busy for a month on just this one show if i wanted. anyway, the owner of this car, who happens to be the guy taking a picture of his friends, found me at the front of the lot, and specifically asked if i had taken any of his car. at that point, no, i had passed it by, because the hood was up. he went directly back and closed the hood, just for me. it had a nice big chromed engine, but no interest for me. i took several shots, but this one was my better half's pick of the bunch. hope you like it.